The Welsh medium stream at Brecon High School is to close, Powys council's cabinet has decided. It wants Welsh medium education to be centralised at Builth Wells High School instead but the plan has been strongly opposed by parents worried that pupils face a 40-mile (64km) round trip. The council said pupil numbers had decreased to such a low level that the Welsh medium stream was not viable. A total of 19 children are currently educated in the Welsh medium stream. That is down from 67 in 2010-11. The cabinet voted 5-2 in favour of the recommendation. But the decision has been met with strong opposition from Brecon High parents and supporters of Welsh medium education. 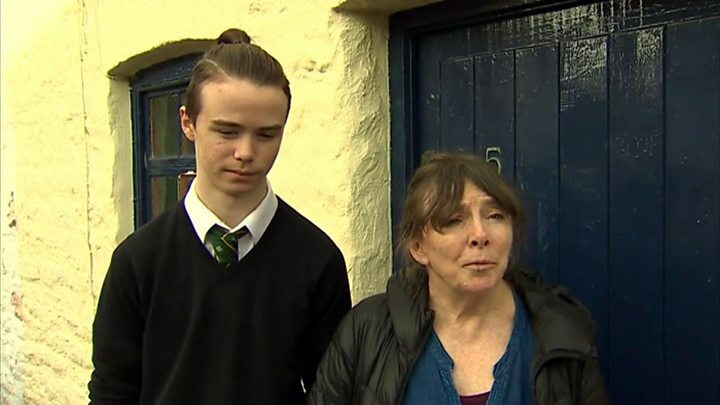 Sian Drinan, whose son Berwyn is a pupil at the school, said expecting children to travel 20 miles (32km) each way to access Welsh medium education was "unacceptable". Lisa Jones, whose three children have gone through the Welsh stream, said it was a very sad day. "Until very recently children have been getting eight GCSEs through the medium of Welsh and I know of five pupils who have gone to Oxford, including my daughter," she said. Rhian Young added: "The number of children who are going to leave the Welsh language, it's such a great shame, when it was starting to be a big thing here in Brecon." But Councillor Arwel Jones, cabinet member for education, said increasing the provision for the Welsh language at Builth Wells would attract more pupils. "If the quality of education is there, pupils will travel," he said. This is a mirror image of what we have seen recently at Llangennech in Carmarthenshire, where there is a campaign centred around closing the English medium stream and making the school entirely taught through the medium of Welsh. In both cases there are strong protest groups keen to make their voices heard. 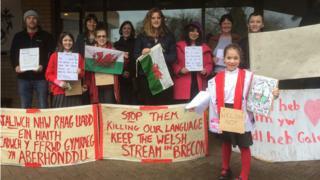 In January, Carmarthenshire county council voted in favour of making Ysgol Llangennech Welsh medium from September, removing the English stream. A bitter debate took place at County Hall with 38 councillors voting in favour of the plan and 20 against. Carmarthenshire council says it wants to extend Welsh medium provision in schools partly in response to census figures which show a fall in the number of Welsh speakers in the county. Parents in Brecon had vowed to continue their fight for Welsh medium secondary education in Brecon even if the cabinet vote went against them. They warn the future of Welsh in the town could be under threat if children there are not able to continue learning in Welsh at secondary level locally. They say they have been fighting for two years and are prepared to take their battle for what they say is their right to the courts. The parents have not ruled out standing in the forthcoming council elections on the single issue of the Welsh-medium steam issue. This is a battle set to continue.